An Early Vegan Feast & How to Never Peel a Butternut Squash Again – Is It Vegan? Thanksgiving is approaching fast. My sister in law reminded me this weekend when she asked what we were planning to bring to the family feast. I hadn’t decided yet. Wait…I still haven’t decided! On Sunday I was preparing to cook up a slew of recipes to freeze for the next few weeks. These “Sunday Cook-Offs” as I now refer to them, have proved to be quite handy when @isitvegan and I are busy working. The freeze ahead meal thing was something I didn’t think I could do, but I’m now a convert. I love it. I love the ease of healthy weeknight meals and always having lunches and going out to eat because we want to, not because I’m too tired to think about dinner. I’ve been creating a list of good freeze ahead recipes and some notes on how to do one of these all day cooking adventures. That’s a post to come in a few weeks. Today’s post is actually about the flavors of Thanksgiving. Everything I made yesterday was full of sage and thyme…and roasted squash and cranberry dressing. The end result was lots of warm cozy comfort food. 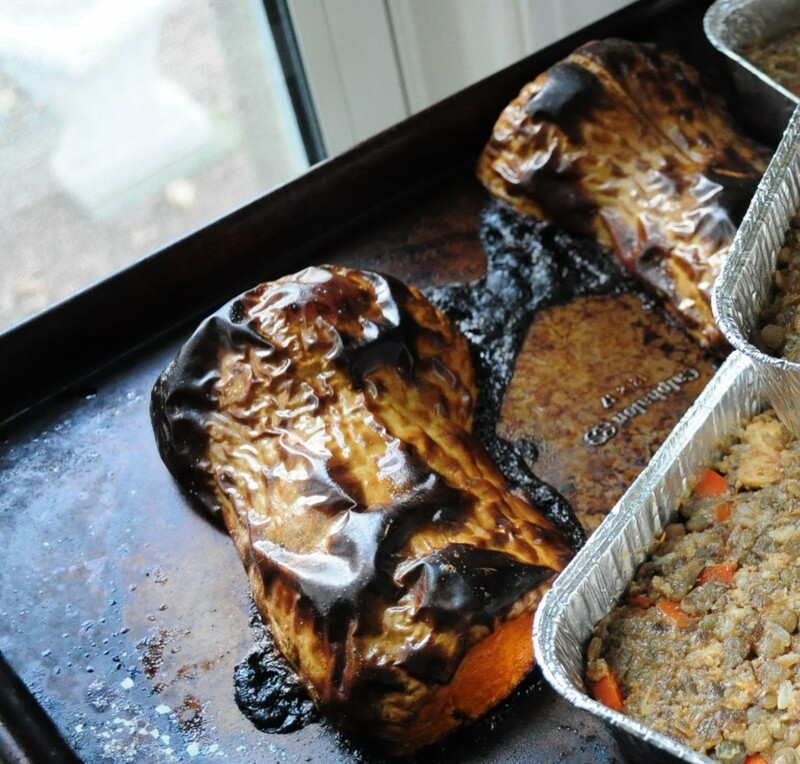 Between the butternut squash, the sage breadcrumbs and the chickpea patties, I realized as I was packing things up for the freezer, that I had produced an entire Thanksgiving meal. 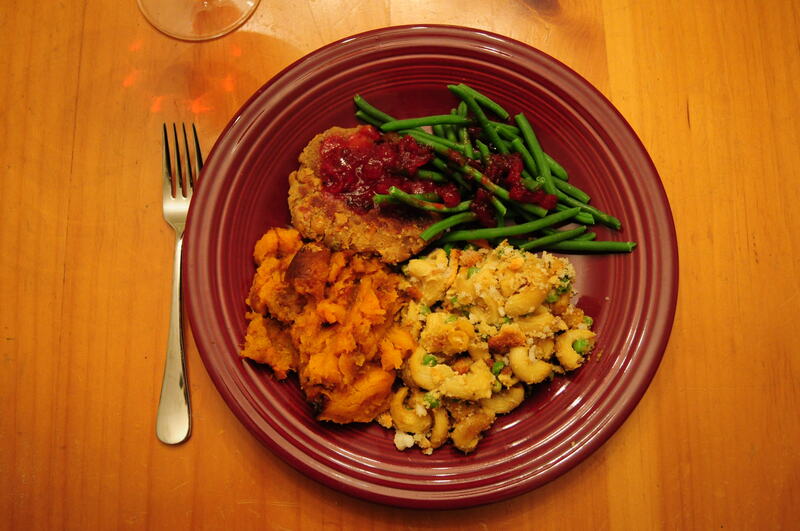 Pictured here is a roasted butternut squash, green beans, chickpea patties (a la Veganomicon) and a vegan mac’n’cheese with sage crumb topping. And it wouldn’t be a proper Thanksgiving meal without a cranberry sauce. 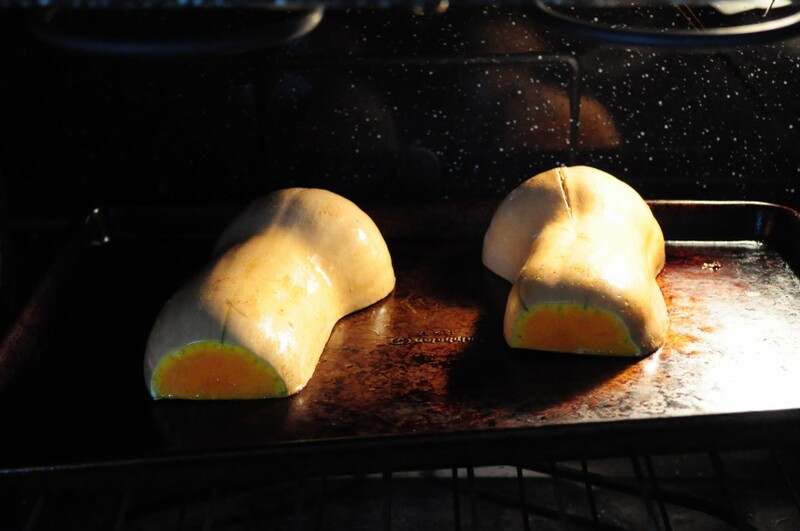 Roast the squash for 45 minuets or so. Maybe an hour if you forget about it. (oops!) When done, the skin will be wilted, brown and bumpy. Let it cool for a few and then scoop out the vibrant squash meat, savor the caramelized brown bits, and give thanks that you didn’t have to peel that sucker.